I attended the CNMI Bar Association luncheon on 5/13, 2008 and listened to a presentation by Deanne Siemer about the recently issued emergency regs. I also read the regs which Deanne provided in advance. There are some interesting, and troubling, aspects to what's going on just now as our current administration responds to ISLA, P.L. 110-229 (chapter 7) [ f/k/a S. 2739]. 1. Deanne's most outrageous statement was probably her boast that she's urging vociferously that Governor Fitial fight P.L. 110-229 with litigation in court. She thinks the law is terrible because from her viewpoint it is intended to shut down the CNMI's economy and prevent our recovery and any possible move in that direction. Her unstated view of our economic recovery is essentially-we will get rich off the backs of poor foreign workers. We need cheap foreign labor for any economic success. We are incapable of finding a niche in any economic market if we can't take advantage of cheap, non-citizen, workers whom we can abuse and misuse. Although she reiterated several times how horrible she thought the new federal immigration law is and how she is urging Governor Fitial to litigate (and mentioned that she herself is a litigator), I didn't hear her state any legal grounds upon which the law would be challenged. 2. Deanne went through the emergency regs. The government has come up with a number (22,417) that represents an assessment of how many aliens are in the CNMI who entered or renewed under a permit that would entitle them to work. Not all of these entered as "contract workers." For example, an IR spouse would be entitled to work and would be counted in this number. Trafficking victims, regardless of how they entered, who have been given special P permits are included. Missionaries are included, etc. This number (22,417) is the cap that is now in place under ISLA, according to Deanne. (ISLA contains a provision that says the CNMI cannot increase the number of alien workers once the law becomes law, which was 5/8/2008). 3. In order to comply with the cap over the next year, the regs use a "body for body swap" method. One alien out who is counted in the number means one can come in. This will keep the CNMI from going over the cap. 4. The devil is in the details. When I read these emergency regs before the CLE presentation, they seemed almost innocuous, and in some ways, good. When Deanne explained how they would be interpreted, I began to see through the veil of nice words. A company may claim the "slot" for the body-for-body-swap if they repatriate an alien worker. BUT THE WORKER DOES NOT HAVE TO BE THEIR WORKER! The company has 90 days to claim the slot. If I understood correctly, a company can repatriate aliens facing deportation proceedings and claim the slot. Wendy Doromal noted in a recent blog post that the newest Labor policies call for deportation of workers with unsatisfied judgments (absent a court order providing for their staying and getting a transfer) and she asked on her blog, Unheard No More, where the money would come from to deport workers--well, here's where it will come from. Companies that want to bring in new workers can get a slot for every worker they repatriate. I fear this will encourage companies to "help" aliens return against their wills and then claim the slot. 5. It wasn't quite clear to me whether the company who repatriates an alien owed money by a former employer would have to pay for the judgment, but at one point Deanne did seem to say that employers might be able to buy the voluntary departure of aliens owed money by paying the money owed. According to her, there are many aliens owed small amounts of money (she mentioned $200 or $300). It would be much more helpful if companies were required to pay the judgment through court (or even DOL) and there is verified payment--not just some signature by the foreign worker (who may be pressured or tricked into signing a complete satisfaction in order to get some/any money). 6. There was some talk about "voluntary" departures. This was in the context of aliens overstaying, who might be given a one-time opportunity to voluntary depart without any stigma or deportation effect, meaning they could come back with a job, if possible. Companies who want to secure the slot of such an alien would pay for the repatriation. Deanne said that under U.S. law there is a complete ban on return if you are deported. And she talked glowingly of the DOL website with job listings that aliens in their home countries could peruse in order to secure a means of returning. I would need to check further on all of this, and for now remain skeptical. 7. She mentioned that companies could get slots in other ways, through a point system for unclaimed slots, a lottery, for "anticipated projects" and, in some cases, just because the Labor Department gives them slots within DOL's discretion. To me, this seemed to indicate that DOL would continue to operate in an arbitrary and capricious manner to the benefit of some and detriment of others. 8. Temporary absences by foreign workers (for medical leave or vacation) will not be counted as a departure/repatriation. This seemed sane and reasonable. 9. 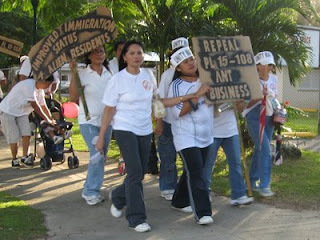 Deanne continued to praise CNMI PL 15-108 as a wonderful law designed with the possible loss of immigration in mind. I've blogged a little on PL 15-108 and believe it to be fundamentally flawed-attempting to preserve a two-tiered system where locals are "trained" for management with higher paying jobs while aliens do the real work and get paid a pittance. What I found interesting was how NOW Deanne is saying this law was supposed to be in anticipation of federalization of immigration, not in lieu of it, when originally it was touted as a reason why the U.S. should back off of its attempt to apply U.S. law to the CNMI. 10. Deanne said there are about 1,900 illegal aliens in the CNMI. She foretold a complete quagmire in the transition, believing the U.S. will be incapable of handling all of the immigration caseload. I didn't believe her. Right now, one judge in Superior Court handles the deportation calendar. I don't see why Judge Munson in federal court would be less capable. Nothing about the structure of the AG's office and DOL make me think they have a lock on doing it right and the U.S. would automatically screw up. 11. The periodic exit requirement of P.L. 15-108 will not be enforced, according to Deanne. It wasn't clear to me if that was throughout the period leading up to the transition, or if it only applied for only the first six months, subject to being enforced especially if the start date of the transition period is delayed. 12. Deanne said the DOL is honoring "two year" contracts, so that alien workers can, if their employers agree, renew now or at their regular renewal date for a new 2 year period of work. I need to think about all of this more and get a better handle on the details. I don't think the emergency regs are completely bad. I think they at least nod at following the letter of P.L. 110-229, but I don't think they're quite in keeping with the spirit of that law. Guess we'll see how things play out. I really don't see why cheap labor is a selling point for investing in the CNMI anymore. The WTO took care of the garment industry. Fuel costs are making almost anything that would export from Saipan almost a waste of time and money if we weren't making Ipods. China is a world's manufacturing giant and will be for a LOOONG time and Multinationals are already lining up vietnam and other countries for cheaper-than-china labor. I mean even old man Ford made sure his employees were paid a living wage, enough to buy one of his cars!